I am a big girl. Not like in the song “Big Girls Don’t Cry”, but a plus size woman. I am also an athlete and a purple belt in Brazilian Jiu Jitsu. When I bring up in conversation that I do Jiu Jitsu, there will always be the person who looks at me funny when I tell them that not only that I do Jiu Jitsu but that I also compete regularly. They have a hard time comprehending that someone of my stature could even do such things. I go for regular medical checkups and everything checks out just fine. My doctor in her wonderful way told me that there are fat football players that play professionally so we can just lump me into that category. Umm thanks I guess? When I first started doing Jiu Jitsu I was bigger than I am now, and I was so self-conscious. As an overweight, older, mom in a gym full of fit young men who (I am not kidding when I say this) could easily be calendar models I was hesitant to try techniques. I was so sure that I would like an ungraceful elephant trying to do yoga and be a spectacle. Maybe it is my maturity or just my comfort level with my team mates, but I feel my insecurities growing less and less the more that I attend class and compete. Most likely it was my professor Joe Wilk repeatedly saying over and over that “Great things never came from comfort zones.” He says that to me A LOT! I have so much more confidence now and people in my past have even commented about how much I have changed. When I finally decided that this is me, this is who I am right now and owned myself, I began to realize I can do things. I may not be exactly graceful at them because I can trip over imaginary lint, but I can execute them. And when losing weight getting stuck in someone’s guard who previously couldn’t close their guard around you is a whole new game for sure! Don’t get me wrong, I consider myself currently “under construction” and I have some goals in mind for my weight and am currently working towards the goals. There are days when I feel like a stuffed sausage in my gi pants, especially when it is that lovely time of the month. Apparently, mother nature doesn’t care that that we compete in spandex pants. And occasionally when I am competing in an absolute division the scene from “Avengers” comes to my mind. The scene where Hulk is smashing Loki and calls him a “Puny God”, that’s how I feel when a much smaller opponent jumps guard and tries to use my weight against me. However, that passes very quickly. My point of this article is this; I am not apologizing to anyone over my body size. My uniqueness is just that…. mine. Just like whatever makes you unique. Life is way too short to worry about what others think of you. Treat people with kindness and they should reciprocate, if not that is a problem of theirs. And as far as the people who doubt that I do in fact do jiu jitsu, I always invite them to class to see for themselves. You never know…. they may be a perfect training partner! Kim Morris is a purple belt with Combative Sports Center in Manhattan Kan., under Joe Wilk. She has been practicing Jiu-Jitsu since November 2013. Great post! I am also a bigger girl, and I am especially self conscious about it, especially with all of the young ones at the gym. Recently, though, I have been using my heft to my advantage by using pressure to my advantage. I don’t plan on being this big forever, but I’ll embrace it rather than condemn it. Your post is very encouraging! Yessss! I feel myself jumping up and down reading this article! 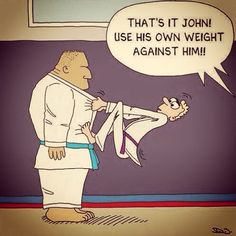 I am a super heavy blue belt on my way to purple and I also compete, when my shoulder isn’t being a pain. I relate to this SO MUCH, and I also get the glances when people learn that I train regularly. I also look super girly with bright blonde hair and the makeup and all off the mats. I have lost 60lbs since I started and I’m still hoping to lose more, training hard and following my goals. But for now, I’m a badass super heavy blue belt. Who is 41 years old by the way. And I love who I am in this moment. I’m an athlete. I’ve never been able to say that before. High five to you, lady! Give ’em hell. Thank you Kim for your story! 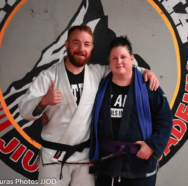 I am 55 a “big” girl and recently signed up for BJJ. Although I haven’t went to class yet!! Crazy I know!! I have been very hesitant afraid of how my gi will fit and me passing out from all the exercise. After reading this tonight , tomorrow I am gonna walk in there and take it slow. I have always wanted to participate for several years now and after reading your story I realize that I am not unique and there is no reason I should apologize or feel self conscious about myself. Your story was meant for me to read!! Cynthia I am so excited for you! You have a great plan, just take it slow. My professor told me this and I will pass it along to you. Each time you go to class you will get a puzzle piece. The piece will not make sense by itself. But the more times you go to class you will pick up more puzzle pieces. Eventually you will start to put the pieces together. Hope that helps! Good luck on your BJJ journey!